Physical exercise is important to maintaining the health of your heart and lungs. However, fitting in time to exercise can be challenging, and nighttime may be the only available option. A misconception is that exercise before bedtime — even hours before — is detrimental to your sleep. While this may be true for some populations, for the most part, exercise before bed — even 30 minutes before you go to sleep — is not bad for you. Working out at night isn't necessarily detrimental. In fact, with the right timing (within four hours before sleep) and level of intensity (moderate to low intensity), exercise before bed can be beneficial. A study published in 2019 in the journal Sports Medicine discovered that people who exercise within four hours of going to sleep found no difference in the time it took them to fall asleep, which is to say that exercise doesn't necessarily make sleep any worse. In fact, the researchers found that the study participants who exercised got more hours of deep sleep than their sedentary counterparts. However, there was one exception to this finding. Those who worked out rigorously before bed had more trouble falling asleep because it took more time for their heart rate to normalize and reach resting rate before bedtime. Moderate activity, on the other hand, should have a calming effect, although this can vary from person to person. 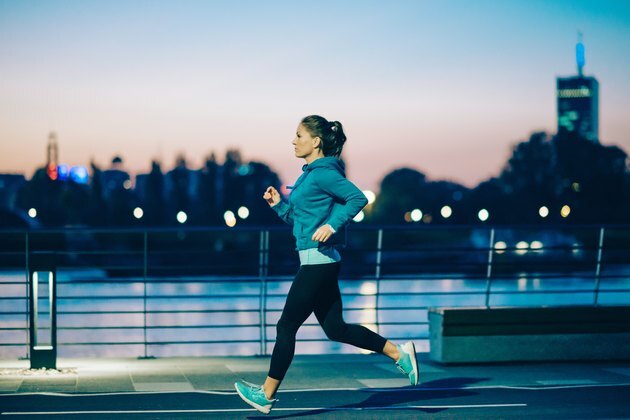 In some instances, exercise can actually help you before you go to sleep. This is true if you have a sleep disorder such as insomnia. According to the National Sleep Foundation, a handful of studies have shown that exercise improves sleep for those who suffer with chronic insomnia. There are a couple reasons why sleep may improve with physical activity. The first reason is the body-heating effect of exercises, especially when done in the afternoon or evening. The body heats up during exercise, and the drop in body temperature post-exercise may contribute to a better night's sleep. Exercise may also help insomnia because it decreases, arousal, anxiety and depression symptoms, which are often linked with the sleep disorder. Finally, exercise may positively affect circadian rhythms, depending on the time of physical activity. The link between exercise and sleep differs from person to person. Some people who exercise vigorously before going to bed do not experience trouble sleeping, while others have greater difficulty. The release of hormones like adrenaline, norepinephrine and cortisol, for example, can make it difficult to fall asleep. Even though adrenaline levels fall back to normal shortly after exercise, norepinephrine can stay elevated for up to 48 hours. Peaks in cortisol levels can also throw off the sleep cycle, so it's important to find the right exercise time and intensity for your body. When deciding what's best for you, consider the benefit of exercise to your body and weigh that against how difficult you find it to sleep. If you decide to exercise before sleep, follow with relaxing activities and bedtime rituals to help you wind down and go to sleep. Try activities, such as reading a book or listening to relaxing music, and reduce excessive noise while making your room cool and comfortable. Taking these steps can help offset the added alertness you may experience after your before-bed workout. Outside: Can a Hard Workout Cause Insomnia? National Sleep Foundation: How Does Exercise Help Those With Chronic Insomnia?